A racing mal is a type of paddleboard that is propelled using the arms while lying flat or kneeling. Boards are normally ten feet and six inches in length. The volume varies depending on the weight of the rider, generally within a 10 kg range. For example, a particular board might be suitable for a 75-85 kg rider. An incorrectly sized board may provide insufficient flotation, or be harder to control. A racing mal includes four straps that the rider uses to control the board while catching waves, and while 'popping' or 'rolling' when paddling out. An optional fifth strap, known as a 'running strap' or 'popping strap' may be positioned on the left or right side (the opposite side to the rider's dominant hand). This strap is used for grabbing the board when exiting the water, so as to quickly sprint up the beach during a race. It can also be used to regain control of the board after popping over a wave. 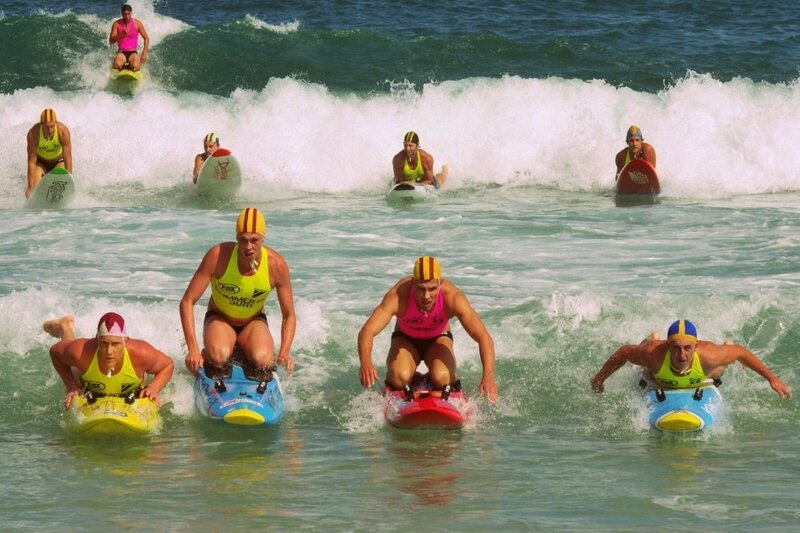 Any racing mal that is used to compete in Surf Life Saving events must adhere to SLSA design specifications. For example, the guidelines state that any new board manufactured after 1st December 2012 must have the first 10 cm of the nose and tail, on the top and bottom of the board, painted in a high-visibility colour. 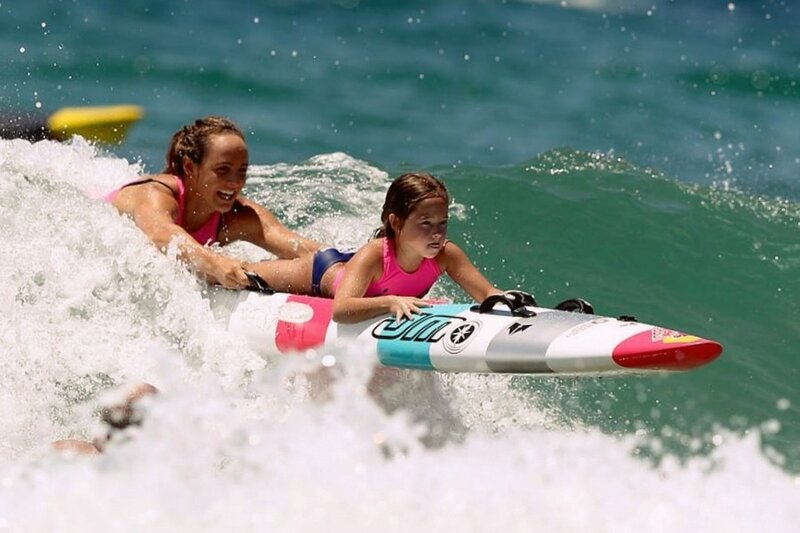 A Nipper Board is similar to a racing mal, but designed for younger riders - and therefore smaller and lighter. 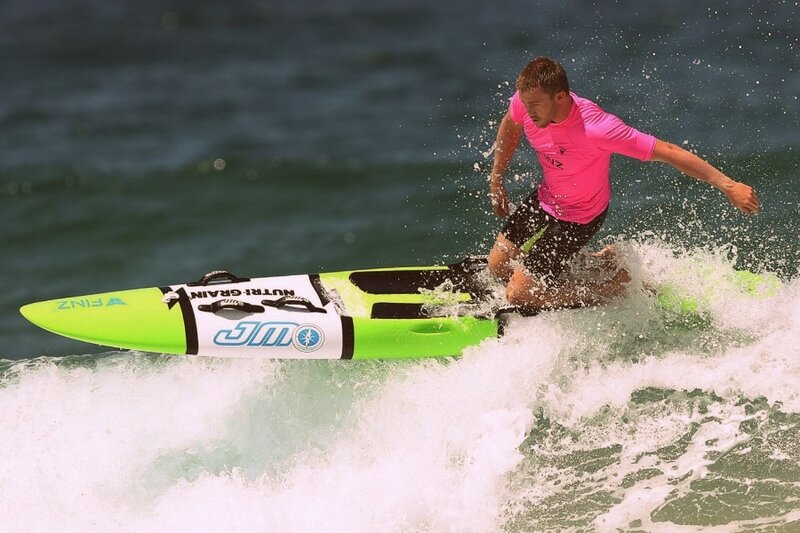 A Surf Rescue Board is also similar to a racing mal, but wider and more stable, with sufficient volume to support two riders (rescuer and patient). 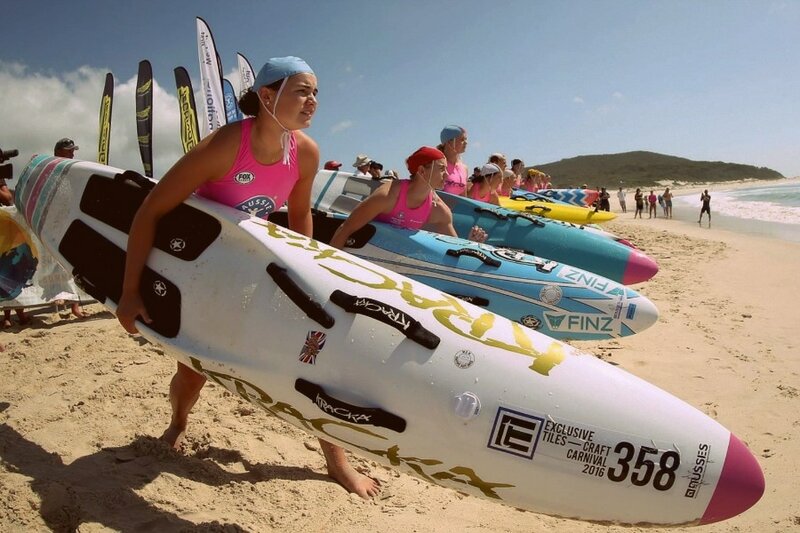 Racing mals are also known as racing boards, ten-six boards, sprint boards, surf racers, or clubbie boards (because they're ridden by Surf Lifesaving Club members). Regardless of the manufacturer, most racing mals are similar in appearance and performance, since they're built to a design that complies with SLSA competition regulations. However there are subtle differences that influence how the board handles, with a trade-off between speed and stability. A wider and flatter hull provides a more stable ride (easier for beginners) but at the expense of speed and acceleration. Competitions are won using boards designed by all major manufacturers, so ultimately it's the ability of the rider that determines overall performance, rather than the style of board. Racing mals may be built using foam, fibreglass, carbon fibre, or a combination of materials. Foam boards are soft, safe, relatively inexpensive, and great for beginners, but they lack the performance of a fibreglass or carbon fibre board. Fibreglass is the most commonly used construction material. Carbon fibre boards are stronger and more rigid (less flexible) than fibreglass, but the extra stiffness is not necessarily an advantage. Some riders prefer the feel of a fibreglass board compared to the more expensive carbon fibre alternatives. Many manufacturers offer fibreglass boards with optional carbon fibre rails or sections to increase strength without sacrificing flexibility. Some boards are relatively plain, while others boast impressive artwork. The more intricate the graphics, the higher the price tag. These are the most important sections of a racing mal. There are several well known racing mal manufacturers across Australia. Most are based in New South Wales and Queensland. Standard off-the-shelf boards are usually available immediately from stock, however if you're looking for a custom design or artwork there will often be a waiting period of several weeks or months, especially around Christmas time. Manufacturers can finish their boards with almost any airbrushed or digital image. So which type of racing mal is the best for beginners, intermediate and advanced riders? This is really a matter of personal preference, because all boards produced for competition are similar in design and must comply with SLSA regulations. Many riders swear by Kracka boards. Others say Dolphins are the best. Bennet boards are also very popular, especially around Sydney's Northern Beaches where the manufacturer is based. 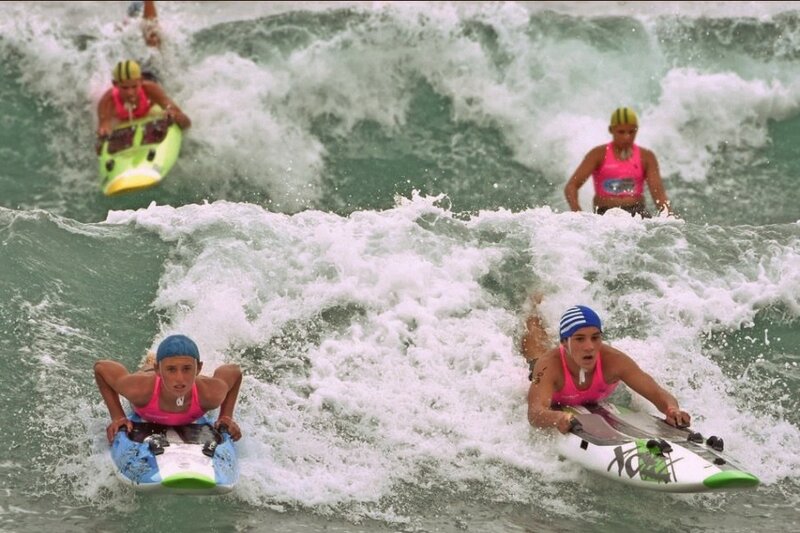 But as mentioned, Surf Life Saving Competitions are regularly won by every model of board, so ultimately it's the skill of the rider that makes the most difference, rather than the design of the board. Some of the most popular racing mal manufacturers include Bennett, Bravo, Dolphin, Gardner, Hayden, Infront, JM, Kracka and Mango. Click on the logos below to visit the website for each manufacturer. Most of these firms also produce a range of other surf craft, including Rescue Boards, Nipper Boards and Surf Skis. Used racing mals can also be purchased from a variety of sources. Your local Surf Life Saving Club may have old boards for sale at the end of the season, and members may post boards for sale on Facebook groups or other social media channels. The websites below also list a wide range of second-hand boards currently for sale, often for around half the price of a new board, depending on age and condition. Costs vary between manufactures, but this is a rough guide to prices in Australian dollars excluding GST at the time of writing (January 2017). Second-hand boards are available for roughly half to two-thirds of the price of a new board, depending on condition. This section explains how to control your racing board in the surf and on flat water. For a demonstration of these techniques, watch the videos at the top of this page. As with any surf craft, it's best to start in flat water before venturing into the ocean. This will allow you to get a feel for the board in safer conditions without having to worry about waves and currents. Racing mals are tricky to balance at first, especially in the kneeling position. But first you'll need to master the prone position (i.e lying on your stomach). Begin by walking into knee depth water to ensure the fin won't hit the bottom. Set the board on the surface and lie along the board. At first you might wish to hang your feet over each side for better balance, but ultimately you'll need to learn to balance with both feet out of the water. Maintain a central position on the board, so it lies flat in the water. Neither the nose nor the tail should be underwater. Likewise, neither end should be sticking up in the air. The board should be as flat as possible. Your legs and torso will be in contact with the board, and you should be looking forward with your chin a few inches above the board. Once you're comfortable in this position, take a few paddle strokes (similar to freestyle swimming strokes). To turn the board while paddling, place one foot in the water. Paddling with your left foot in the water will make the board turn left. Likewise, place your right foot in the water to turn right. You can also turn by paddling with one arm, or by placing one arm in the water, outstretched to the side of the board. As you become more confident, practice entering the water quickly by running to the water's edge with the board under your arm, and jumping onto the board as you throw it forwards onto the surface. The momentum from running will increase the speed of your start. This is an essential skill for racing board competitors as it allows them to quickly accelerate through the surf zone. Prone paddling is much tougher than paddling a SUP. On a SUP (Stand Up Paddleboard) it's quite easy to cruise along with minimal effort and only occasional light strokes. But a racing mal will quickly decelerate when it's not being actively paddled (or pushed along by a wave). Paddling should be slow, strong and relaxed, reaching deep into the water with each stroke. Don't flail your arms around madly like a windmill, as you'll simply burn yourself out and lose control of the board. The catch (when your hand first enters the water) is the most important part of the stroke. Keep your hand relaxed, fingers slightly parted, and wrist tilted at 45 degrees. Pull your hand through the water alongside the board. Picture your hand locking into the water and pulling the board past that point, rather than pulling your hand back past the board. Once your hand reaches your shoulder, bring it out of the water smoothly (this is known as the 'release'). Rather than thinking about lifting your hand, think about lifting your elbow, thereby drawing your hand straight up out of the water. Keep your elbow high as your hand moves forward for the next catch. A high elbow transfers the effort from the arm muscles to the larger and stronger back muscles. Some paddlers kick their opposing leg as each arm takes a stroke (by bending the leg at the knee). So the opposite arm and leg work together. As the left arm pulls, the right leg kicks. This lets you reach slightly further forward for a more powerful catch, and helps to balance the weight shift caused by reaching forward. At all times keep the board flat on the surface of the water. If the tail or nose are underwater, then the board will drag and be much harder to paddle. If you fall off, simply grab the handles and roll back on. If you fall off in the surf, always try to keep hold of a handle so that the board doesn't get pushed away from you by the waves. Unlike a surfboard, you're not attached to your racing mal by a leash (leg rope), so it's quite easy to lose your board in the surf, in which case it will usually be quickly pushed into the shore by the waves. You should always be confident of your ability to swim back to shore and retrieve your board if this happens. 1. To have a rest. If you're tired of paddling you can sit to get your breath back. It's quite easy to balance in the sitting position. 2. To take a look around. By sitting up, you raise your vantage point and can easily take in your surroundings and decide where you want to paddle to next. 3. To turn around quickly. While sitting with your legs in the water, rotate your legs and feet in a clockwise direction to spin the board anti-clockwise. Rotate your legs anticlockwise to spin the board clockwise. To spin more quickly, sit back further on the board so the nose lifts out of the water. 4. If you're catching waves then you may also sit up while waiting for the next wave to arrive. In this position, you kneel on top of your board with your lower legs in contact with the board's soft knee-pads. Keep your back straight. The higher you lift your torso, the harder it will be to balance, but the more power you can generate through paddling. Knee paddling takes a long time to master. At first, you'll find it almost impossible to remain balanced, even on flat water. And it becomes exponentially more difficult in the ocean - especially in choppy conditions. 1. It's faster than prone paddling, as long as you don't fall. 2. You have a better view of your surroundings from a higher vantage point. 3. You use different muscles than when prone paddling. Switching between the two positions allows you to keep paddling for longer without tiring. 4. It's easier to control the direction of the board when catching waves while kneeling, by placing one hand in the water to angle the board along the face of the wave. To paddle while kneeling, reach as far forward as you can without losing balance, and catch with both arms at the same time. Imagine you're grabbing the water in front of the board and pulling the board forwards to that position. During the stroke, keep your head looking forward. Your arms should enter as deep as possible into the water - up to your elbows if possible. Keep pulling until your hands reach a point between your knees and feet, and then raise your arms from the water and reach forwards again for the next catch. If you're finding it hard to balance, keep in mind that riding a racing board is a bit like riding a bike. It's almost impossible to balance on a bike when it's not moving, but the faster you're traveling the easier it is to maintain your balance. Ironically, it's easiest to balance on your knees while actually catching a wave, because the forward momentum helps keep the board upright. Navigating the surf zone is an essential skill. If you can't make it through the break, then you won't be able to catch waves or paddle far into the coean. There are three ways to tackle an incoming wave - you can go over it, under it or through it. Your choice will depend on the size of the wave and whether or not it has already broken. For small broken waves, with about one foot of foam, simply paddle into the wave as fast as possible and you'll punch straight through it. The secret is not to hesitate. The faster you're moving towards the wave the easier you'll get through. Just keep paddling hard and don't stop until you're on the other side. For slightly larger broken waves with about two foot of foam, the popping technique works best. Paddle strongly towards the wave, and just before you reach it, sit up on your board and lean back slightly so the nose lifts out of the water, just enough for the wave to pass underneath. As the wave hits the bottom of the board, quickly move your weight forward, grabbing the front handle of the board and pushing the nose back down again. The wave will pass under the board and you can resume paddling. For large broken waves with three foot or more of foam, you'll need to roll. Paddle hard towards the wave and just before you reach it grab both front straps of your board and roll the board over so you're in the water underneath it. Keep a strong grip of the straps and hold the board close to your body. After the wave passes overhead, roll back and resume paddling. Regardless of the size of the wave, if it hasn't broken yet, and you believe it won't break before it reaches you, then it's easiest just to paddle over it. If you think an extra burst of speed will get you to the wave before it breaks then it always pays to accelerate. The fastest board racing competitors are those who attack every wave with speed, and then make a last second decision on the best way to navigate the wave when they reach it. If you hesitate, slow down or stop, then you're more likely to get smashed by the wave and pushed back towards the beach, because you won't have the necessary speed to punch, pop or roll past the whitewater. Skilled riders can also navigate smaller waves while in the kneeling position. Paddle hard towards the wave and then lean back to lift the nose of the board. As the wave passes under the board, take a powerful stroke to propel the board over the top. This takes a long time to master, but it's the fastest way to get through the surf zone. This is the fun part. Once you've learned how to balance, paddle, and negotiate the surf zone, it's time to start catching some waves. If it's your first time, choose a day when the waves are quite small - around one to two feet. Begin by paddling out the back, behind the breaking waves, then sit up on your board, get your breath back, and prepare to catch a wave back in. While waiting, rotate your legs to spin the board around to an angle where you can comfortably watch the waves approach. When you see an incoming wave that looks like it might break slightly further in (towards shore) than your current position, spin your board around to face the beach and start paddling. As you feel the wave start to push your board forward, slide your body back on the board (towards the rear) and hold onto the rear handles. If you time it right, you'll be carried to shore by the wave. If you move back too soon, you'll miss the wave and it will pass underneath you. Too late, and there's a risk of nosediving. If that happens, try to keep hold of a handle, otherwise it could be a long swim back to shore to retrieve your board. While the wave is pushing you along, you can turn left or right by dragging your left or right leg in the water, and/or leaning in the direction you wish to turn. If you're feeling adventurous, you can also try popping up onto your knees. While on your knees, drag your left or right hand in the water to turn in that direction. If you wish to get off the wave before you reach the sand, keep a hold of the rear straps and transition into the sitting position with both legs in the water. This will slow you down and the wave will pass underneath you. You can then spin around and paddle back out. Running with the board, and transitioning quickly from land to water, and vice versa, are essential skills for racing mal competitors. Practice running towards the water with your board under your arm, placing it on the surface while maintaining forward momentum, and jumping onto it (in either the prone or kneeling position) at the same time as the board hits the water. Then start paddling immediately. This type of racing start transfers your running speed into paddling momentum and lets you quickly negotiate the first few waves. Timing your run to coincide with a lull in the waves will let you get out faster, however in a real competition you don't get to choose when to go, and must hit the water at speed as soon as the starting gun fires, regardless of the incoming sets. Also practice fast exits by quickly jumping off the board as you reach shallow (knee depth) water, and running with your board back up the beach. In many competitive surf events you'll need to carry your board over the line on the beach to finish. Racing boards don't require much maintenance, as long as you're careful not to collide with solid objects like rocks in the water, or concrete driveways and brick walls on land. Take extra care when carrying your board across roads or paved areas as it's very easy to let the nose accidentally dip onto the ground, leading to chips, scrapes or dents. Superficial scratches and chips can generally be ignored. For more serious dings or dents you can try patching the damage yourself using an epoxy board repair kit, or take it to a surfboard repair shop. Don't ride the board while it's cracked because salt water will enter the foam interior, making the board heavy, damaging the foam, and increasing the likelihood of delamination (where the exterior hard surface of the board separates from the foam interior). Knee-pads and handles may need to be replaced after several years of use. The fin will usually last for as long as the board itself, assuming it doesn't get smashed on a submerged rock. Boards can always be repainted using standard car paints if you'd like to create a new look. But remember to remove the straps and pads before spraying. Racing mals are generally too large to fit inside a car, so you'll need a roof-rack and tie-down straps for transportation. Don't store or leave your board for extended periods sitting in hot sun, since the heat can cause the board to warp or delaminate. Dark coloured boards are more susceptible to this than white or pale boards. If you find your board is too slippy in places, then add some surf wax to the top of the deck for extra grip. Wax will need to be topped up regularly.